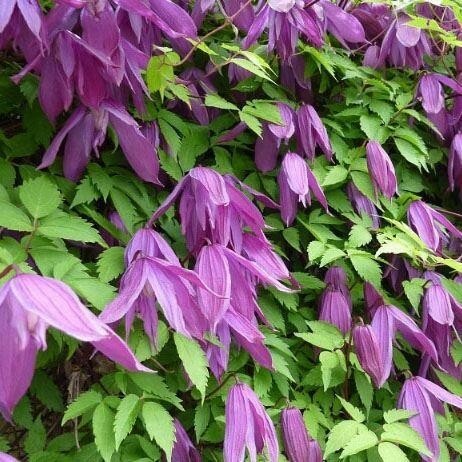 Clematis 'Tage Lundell' is a deciduous climber and a very vigorous growing variety of Clematis. Pretty, deep-purple or purple-red, nodding flowers bloom in Spring and will last through until mid-summer. The blooms are then followed by attractive, woolly seed-heads, adding an even longer period of interest to this brilliant plant. Looks fantastic scrambling through climbing roses or climbing against a wall/trellis. 'Tage Lundell' prefers moist, well-drained soil and will thrive in both part and full shade. Supplied in 2-3 litre containers.